I have been reading articles lately about standing and treadmill computer desks. In a previous post, I wrote about my desire to get in shape this year, and the idea of a standing desk intrigued me. When I first took the music and outreach position here, the youth group painted my office as part of D-Now 2010 (posed a question about D-Now 2011 here). 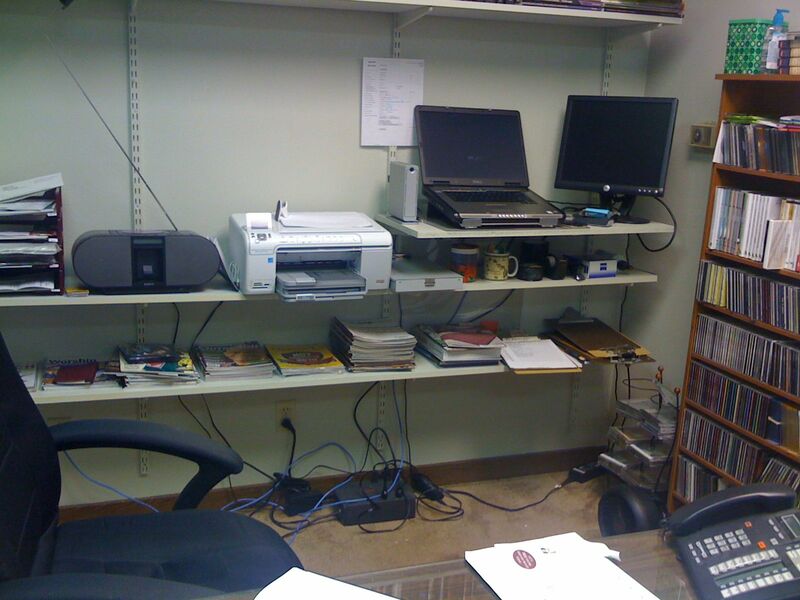 When they did, they stacked all of the stuff that was in my office against the wall in the choir room. I’m embarrassed to say that much of it has remained there until Monday of this past week. 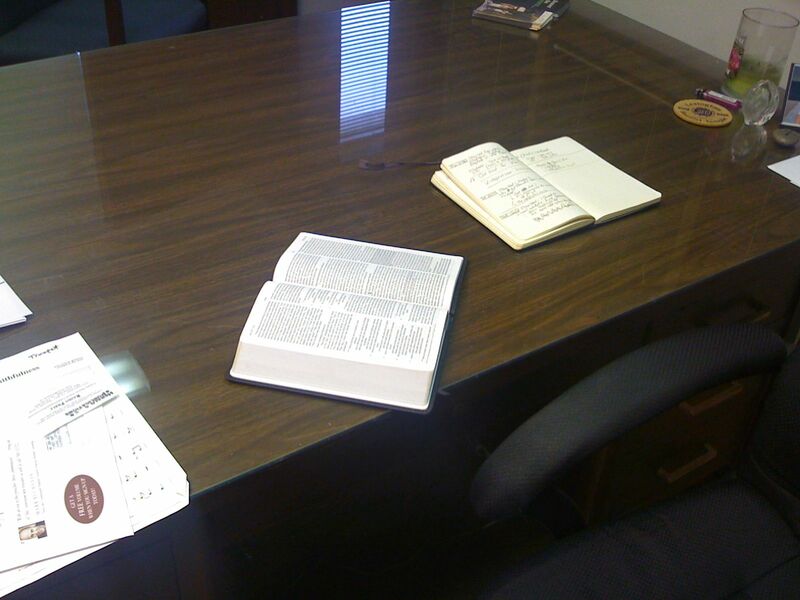 After I cleaned out much of that junk, I turned my attention to my office. I thought back to the articles I’ve been reading, and decided to take the plunge, so to speak. I removed a bookshelf, placed a wider yet shorter shelf at the end of where the shelf used to be, ran the cables, and tried it out. Meetings will potentially go more smoothly without a laptop in my face. Before the move, I had to close my laptop when anyone would come in to speak to me. Not an issue now. I have to be more intentional with my online work. 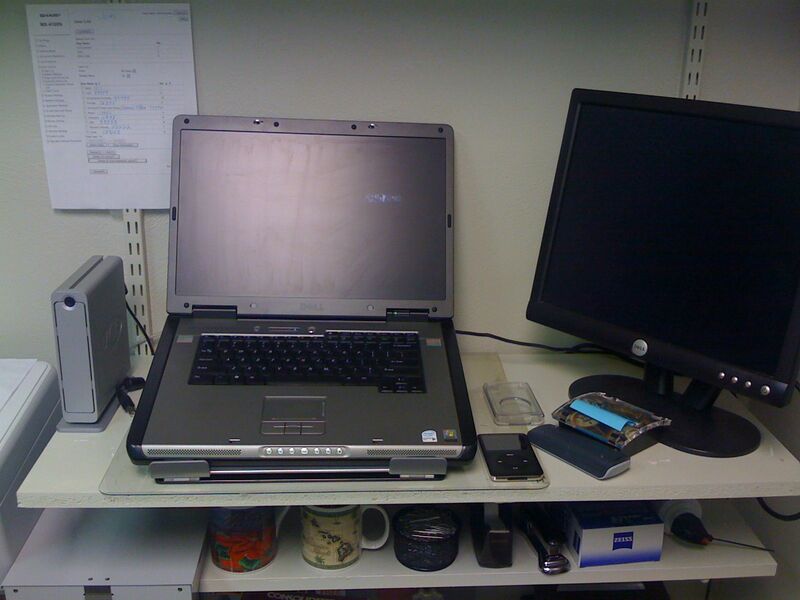 When I need information or need to access anything, I have to leave my seat and go to my workstation. Any time I’m online, I’m on my feet. Obvious benefits and drawbacks. One drawback. I have a great window. Anytime I’m on the computer, my back is to it. I’ll give it some time and report back in a couple of weeks. Well, the Dell in the pictures above died, so I have put my MacBook Air (that is my new main work computer) in its place. Haven’t connected the monitor yet, but I like having my Air off my desk and working on my feet again. I am also using this opportunity to back up the Air to the external hard drive to the left of the Dell (if I can get it formatted – my Mac is the only Mac in the building, which is a worthwhile struggle). My issue now is keeping portability without having temporary wires everywhere. I want to be able to throw the Air into my bag at the end of the day, yet still have a computer on the church’s network if I need to print something or need information. Also, the Air is not designed to be plugged in to power all day, so I’ll have to monitor that more carefully. I might also need a different laptop pedestal. The Air is so thin that the pads that held the Dell are too thick, and they jab me in the wrists as I type. This whole thing is a work in progress, for sure. i like the idea but i believe i wouldn’t like it. would limit your internet time except i would just get on my iphone so would really benefit their. Limiting my Internet time is part of the objective. I’m trying to be more intentional with my time online. Working well so far.